Singapore has a systematic process of attracting foreign talents into the country; this is driven by the strategy to make to city state even more vibrant, diversified and rejuvenated. The GIP is a specific programme to attract entrepreneurial talents into Singapore. From our perspective of having engaged and invested into Singaporean businesses since 1987, this strategy seeds 3 powerful catalysts into Singapore’s economic blueprint. Through the entrepreneurial human resources so inducted into our community: (1) It increases our entrepreneurial talent pool alongside organic growth; (2) It connects us to a wider business network of countries than before; and (3) It strengthens our existing business community with greater capabilities. The GIP application process is managed by Contact Singapore which is an alliance formed between the Singapore Economic Development Board and the Ministry of Manpower. Crest Capital Asia is one of the earliest fund managers approved by Contact Singapore since 2006 to manage investments made under the GIP. Since the Fund started with IE Singapore’s sponsorship, in addition to guiding interested GIP applicants in a transparent and professional manner through the application process, it is the Fund’s mission to help successful applicants assimilate into the Singapore business community thereafter. You must possess at least 3 years of entrepreneurial and business track record and must produce audited financial statements of your company for the last 3 years. There is no specification regarding the nature of the business although some sectors are considered more strategic (Appendix 3). If your company is in other sectors, your company’s turnover must be at least S$50 million in the most recent year, and at least S$50 million per annum on average for the last 3 years. If your company is privately-owned, you should have at least 30% shareholding in the company. Your role in the company, as well as the growth and profitability of your company would be taken into consideration. Your spouse and children (below 21 years old) are eligible to apply for PR under your GIP application. Male dependents will be liable for National Service. Please visit www.ns.sg/iPrepNS for more information on National Service in Singapore. Parents and unmarried children who are 21 years old and above are not eligible to be included in your GIP application for PR status. Instead, they can apply for a 5-year Long Term Visit Pass (LTVP), which is tied to the validity of your Re-Entry Permit (REP). Please refer to Singapore Immigration & Checkpoints Authority (ICA)'swebsite for more details on LTVP: http://www.ica.gov.sg/page.aspx?pageid=177&secid=171. You or at least 1 of your dependents, who is also a PR under GIP, must have resided in Singapore for more than half of the time. You and your dependents who are also PR under GIP, must have resided in Singapore for more than half of the time. As a GIP Fund Manager approved by the Singapore Economic Development Board, we can make the application for you if you like – please see our milestones for the application process in Appendix 2. We present the estimated timeframe for the entire application process according to Contact Singapore below. Please note this time schedule can be affected by the volume of applications received in a specific period of time. You are required to pay a non-refundable application fee of S$5,650 before submitting the application forms. Any transaction fee must be borne by the investor and you should take this into account when issuing instructions to your respective financial institutions for the making of this payment. Contact Singapore will not process the application submitted if the net amount received by Contact Singapore is less than S$5,650. Please also note that payments in excess of S$5650 are not refundable. You should try to send the sum of S$5,650 in a single transaction. The application fee is to be credited to the following bank account using telegraphic transfers from overseas, or local interbank transfer. After making the payment, please ensure that you obtain a hard copy of your payment transaction slip for submission with other documents highlighted in “List of Supporting Documents for GIP Application” uploaded on Contact Singapore’s website - www.contactsingapore.sg/GIP. A scanned copy of the payment transaction slip must also be attached to Form C of the application forms. The time between the remittance of the application fee and the submission of application form must be within 1 month. Please download Application Forms - Form A (Personal Profile), Form B (Proposed Investment Plan) and Form C (Payment Details) from www.contactsingapore.sg/GIP for completion offline. After completing the Application Forms (Form A, Form B and Form C), please upload the forms to https://application.sgip.gov.sg/public. Undertaking on the Terms and Conditions of the GIP. For statutory declarations made in the UK or in a Commonwealth country, it can be done before a notary public, Justice of Peace or other persons authorised under the law of that country to take/receive statutory declarations. For non-Commonwealth countries (e.g. China), all statutory declarations must be signed only by authorised Singapore embassy or consular staff in the non-Commonwealth country. If the applicant is in Singapore, the statutory declaration can be done in the presence of any Commissioner for Oaths, Justice of Peace or Judge in Singapore. Declaration form for Application of Global Investor Programme in Form A. Declaration form for Proposed Investment Plan in Form B. Payment details of Application fee in Form C (with payment transaction slip attached). Application for an Entry Permit to Enter Singapore – Form 4 (1 original and 1 photocopy are required for each applicant included in the PR application). Supporting documents for Form A, Form B and Form C. Please refer to the “List of Supporting Documents for GIP Application” on Contact Singapore’s website - www.contactsingapore.sg/GIP. Please note that official English translations for documents in foreign language must be provided and notarised by the relevant notary public. The validity period for notarised documents is 1 year. If your application is approved, you will be issued an Approval-in-Principle (AIP) Permanent Residence (PR) status by the Singapore Immigration & Checkpoints Authority (ICA), which is valid for 6 months. your personal bank account in your sole name opened in a Singapore-registered bank in Singapore. After making the required investment, you must submit the documentary evidence of your investment to Contact Singapore. These documents include bank statements showing that the investment was made from your personal bank account in your sole name opened in a Singapore-registered bank in Singapore, and your share certificate(s). Contact Singapore will hold these documents in custody for 5 years. If your chosen investment is in a new business entity or expansion of an existing operation under Option A, you will need to submit the audited financial statements as at the end of the 2nd, 3rd, and 4th year of your investment. 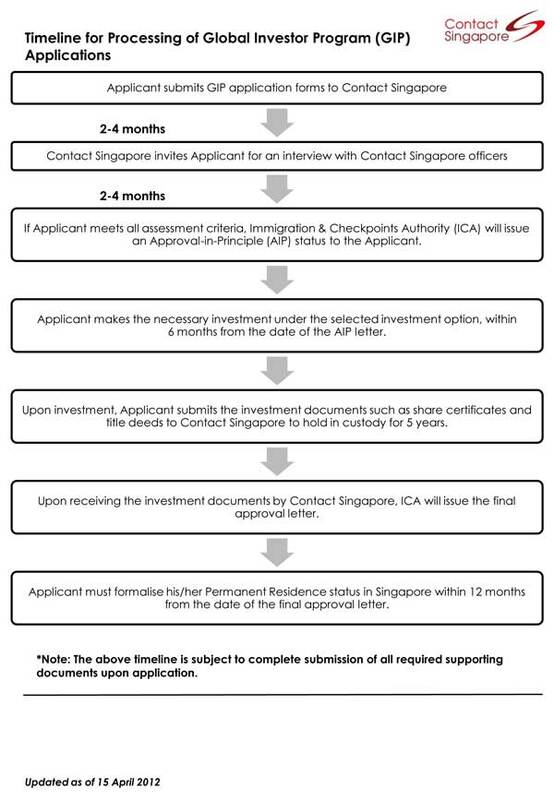 Upon receiving the documentary evidence of your investment, you will be issued a final approval of your PR status by the Singapore Immigration and Checkpoints Authority (ICA). You are required to formalize your PR status within 12 months from the date of your investment. 表格 A、表格B和表格C需要提交的证明文件。请访问联系新加 坡网站 www.contactsingapore.sg/cn/GIP,查阅"全球商业投资 者计划申请者需提交的证明文件清单"